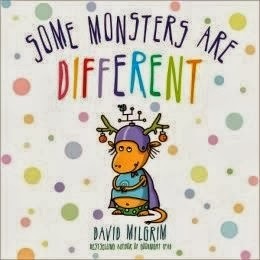 Some Monsters are Different by David Milgrim is a book showing that all monsters are different. This book is aimed for kindergarten reading. There are many differences between everybody and its okay to not be the same as everyone else. This is what this book demonstrates; being different is okay, the book shows how monsters are all different. Each monster is a different shape, size, and color. They show that some monsters are afraid, some are picky eaters, and some are quiet. Some Monsters are Different shows many different ways that monsters are alike as well as different but in the end it shows that everyone is absolutely perfect the way they are. Not everyone is the same and this is perfectly okay, we don’t need to make fun of others for their differences instead we need to accept them and respect everyone for who they are! This represents the element of respect because it shows how everyone is different in their own way, in the end the book shows that you must respect everyone’s difference and that it is okay to be kind and show empathy to their peers who are different from them. “All monsters are absolutely, positively, completely, perfectly, wonderful just the way they are!” is the words the book ends with. I love these words because in kindergarten respect is an important lesson to be taught and that is what this book does. This book shows that everyone can share their backgrounds and differences and everyone will still accept them. In Kindergarten is when children may begin to start noticing differences in skin color, interests, etc. This book shows all those differences in a kid friendly version, which teaches children to respect everyone for who they are. In kindergarten I would use this book to show a lesson that everyone is different and we respect those differences. We would read this book in the beginning of the year to learn that everyone is different and that is okay. I would use this book to get to know the classmates better and respect the things they like and dislike as well. I would pair the students up and they would draw pictures of their partner. They would draw one activity they enjoyed, and something they didn’t like with an X through it. We would share with the class what we learned about our partner and hang these pictures up to show that we respect everyone for what they look like, the things they like, and the things they don’t like. This will teach the children a lesson of respect; it will create a climate of respect for peers and show the diverse classroom we will be in for Kindergarten.